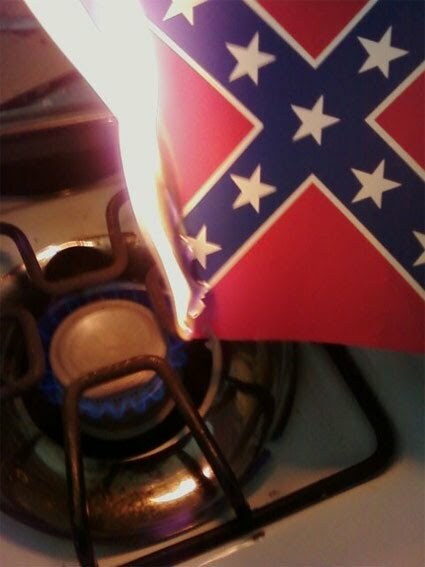 Burn the Confederate Flag Day is a protest against the right's exploitation of racial prejudice for political gain. 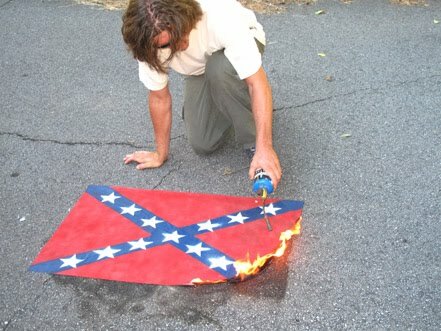 We urge you to burn the Confederate flag, a long-time symbol of racial hatred, on Sept 12, the date when the racially-divisive Tea Party holds its annual hate fest. A few videos and photos. I took a partially burned flag to a local event. Had a few comments from about a dozen or so people who I assume were from southern Washington (I suppose the War of Northern Aggression has forever psychically scarred the proud southerners of Walla Walla). No problems--the police decided to stay close to me. 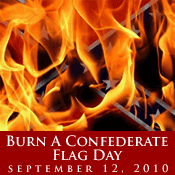 Host a flag-burning party on Sept. 12. Tell us where and when you're holding it, and we'll publish a list of events. Send us photos of the event. We'll post them here. Upload a video of the event onto YouTube. We'll embed it or link to it. Spread the word via Facebook (here's our Facebook group), Twitter, and other social media. Submit your own ideas, below in the comments. We'll use them to update this list.